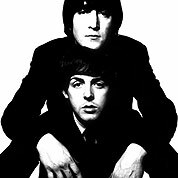 The songwriting partnership of John Lennon and Paul McCartney is one of the best-known and most successful musical collaborations in history. Between 1962 and 1969, they wrote and published approximately 180 jointly credited songs, of which the vast majority were recorded by The Beatles and form the bulk of their catalogue. 60s. Arranged for the solo guitar by Larry Beekman. 44 Measures. 4 Pages. 4/4 Time Signature. key of g.